This section is about a romance film. For the concept in physics, see Theory of everything. The Theory of Everything is a 2014 British biographical romantic drama film directed by James Marsh and adapted by Anthony McCarten from the memoir Travelling to Infinity: My Life with Stephen by Jane Wilde Hawking, which deals with her relationship with her ex-husband, theoretical physicist Stephen Hawking, his diagnosis of motor neurone disease, and his success in physics. The film stars Eddie Redmayne and Felicity Jones with Charlie Cox, Emily Watson, Simon McBurney, Christian McKay, Harry Lloyd and David Thewlis featured in supporting roles. The film had its world premiere at the 2014 Toronto International Film Festival on 7 September 2014. The film opened to a positive reception worldwide and was nominated for a variety of accolades in award shows and film festivals. Redmayne's performance as Stephen Hawking was widely praised, earning him several awards and nominations including the Academy Award for Best Actor. The film received four Golden Globe Award nominations, winning the Golden Globe Award for Best Actor – Motion Picture Drama for Redmayne and Best Original Score for Jóhannsson. It received three Screen Actors Guild Awards nominations, winning one for the Screen Actors Guild Award for Outstanding Performance by a Male Actor in a Leading Role for Redmayne. It received 10 British Academy Film Awards nominations and won Outstanding British Film, Best Leading Actor (for Redmayne) and Best Adapted Screenplay (for McCarten). In 1963, Cambridge University astrophysics student Stephen Hawking (Eddie Redmayne) begins a relationship with literature student Jane Wilde (Felicity Jones). Although Stephen excels at mathematics and physics, his friends and professors are concerned over his lack of a thesis topic. After Stephen and his professor Dennis Sciama (David Thewlis) attend a lecture on black holes, Stephen speculates that black holes may have been part of the creation of the universe and decides to write his thesis on time. While pursuing his research, Stephen's muscles begin to fail, eventually causing him to fall and hit his head. He learns he has motor neurone disease; he will be unable to talk, swallow, breathe or move most of his body, and has approximately two years to live. Stephen asks what will happen to his brain. The doctor tells Stephen that the disease doesn't affect the brain and that Stephen's thoughts won't change but eventually, no one will know what they are. As Stephen becomes reclusive, focusing on his work, Jane confesses her love to him. She tells Stephen's father she intends to stay with Stephen even as his condition worsens. They marry and have a son. Stephen presents his thesis to the examination board, arguing that a black hole created the universe in a Big Bang, that it will emit heat, and that it will end in a Big Crunch. While celebrating with Jane and his friends, Stephen realises he cannot walk and begins using a wheelchair. After having a second child, a daughter, Stephen develops a theory about the visibility of black holes and becomes a world-renowned physicist. While focusing on the children, Stephen's health and his increasing fame, Jane is unable to work on her own thesis and is frustrated; Stephen tells her he understands if she needs help. She joins the church choir, where she meets widower Jonathan (Charlie Cox). She and Jonathan become close friends, and she employs him as a piano teacher for her son. Jonathan befriends the entire family, helping Stephen with his illness, supporting Jane, and playing with the children. When Jane gives birth to another son, Stephen's mother asks Jane if the baby is Jonathan's. Jane is appalled; seeing that Jonathan overheard the conversation, when they are alone they admit their feelings for one another. Jonathan stays away from the family, but Stephen visits him, saying that Jane needs him. While Jane and Jonathan take the children camping, Stephen is invited to attend an opera performance in Bordeaux and contracts pneumonia. While in the hospital, the doctors tell Jane that Stephen needs a tracheotomy, which will leave him unable to speak. She agrees to the surgery. Stephen learns to use a spelling board and uses it to communicate with Elaine (Maxine Peake), his new nurse. He receives a computer with a built-in voice synthesiser, and uses it to write a book, A Brief History of Time, which becomes an international best-seller. Stephen tells Jane that he has been invited to America to accept an award and will be taking Elaine with him. Jane faces the realisation that her and Stephen's marriage has not been working, telling him she "did her best." Jane and Stephen agree to divorce. Stephen goes to the lecture with Elaine, the two having fallen in love, and Jane and Jonathan reunite. At the lecture, Stephen sees a student drop a pen; he imagines getting up to return it, almost crying at the reminder of how his disease has affected him. He goes on to give an inspiring speech, saying, "There should be no boundaries to human endeavor. We are all different. However bad life may seem, there is always something you can do, and succeed at. While there's life, there is hope." Stephen invites Jane to meet the Queen with him; they share a happy day together with their children, with Stephen saying "Look what we made". An extended closing series comprises select moments from the film shown in reverse back to the moment Stephen first saw Jane. A final title sequence brings the lives of the lead characters up to date. Jane and Jonathan are happily married and she has completed her PhD. She and Stephen remain close friends. Stephen declines a knighthood and continues his research. "That's really the essence of the story, it's a very unusual love story in a very strange environment, a very strange sort of landscape, and that is I think the abiding theme of the film. It is how these two characters, these two real people transcend all the complications and curveballs that life throws at them." Screenwriter Anthony McCarten had been interested in Hawking since reading his seminal book A Brief History of Time in 1988. In 2004, McCarten read Jane Hawking's memoir Travelling to Infinity: My Life with Stephen and subsequently began writing a screenplay adaptation of the book with no guarantees in place. He met numerous times with Jane at her home to discuss the project. After multiple drafts, he was introduced in 2009 to producer Lisa Bruce via their mutual ICM agent, Craig Bernstein. Bruce spent three years with McCarten further convincing Jane Hawking to agree to a film adaptation of her book, with Bruce stating, "It was a lot of conversation, many glasses of sherry, and many pots of tea." On 18 April 2013, James Marsh was confirmed to direct the film with the shooting being based in Cambridge and at other locations in the United Kingdom, with Eddie Redmayne courted to fill the male lead of the piece. On 23 June 2013, it was revealed that Felicity Jones was confirmed to play the film's female lead role opposite Redmayne. On 8 October 2013, it was confirmed that Emily Watson and David Thewlis had joined the cast, and that Working Title's Tim Bevan, Eric Fellner, Lisa Bruce, and Anthony McCarten would be producing the piece. Filmmaker Marsh had studied archival images to give the film its authenticity, stating, "When we had photographs and documentary footage of Stephen that related to our story, we tried to reproduce them as best we could." Redmayne met with Hawking himself, commenting, "Even now, when he's unable to move, you can still see such effervescence in his eyes." And described portraying Hawking on-screen as a "hefty" challenge, adding that, "The real problem with making a film is of course you don’t shoot chronologically. So it was about having to really try and chart his physical deterioration [so] you can jump into it day-to-day, whilst at the same time keeping this spark and wit and humour that he has." Redmayne spent six months researching Hawking's life, watching every piece of interview footage he could find of him. He studied Hawkings' accent and speech patterns under dialect coach Julia Wilson-Dickson to prepare for the role. Marsh stated that what Redmayne had to do was not easy. "He had to take on enormous amounts of difficult preparation as well as embracing the difficult physicality of the role. It's not just doing a disability. It's actually charting the course of an illness that erodes the body, and the mind has to project out from that erosion," he said. He added that Hawking gave him his blessing and also revealed that, "[Hawking's] response was very positive, so much so that he offered to lend his voice, the real voice that he uses. The voice you hear in the latter part of the story is in fact Stephen's actual electronic voice as he uses it," he said. It was revealed to the Toronto International Film Festival audience that as the lights came up at a recent screening, a nurse had wiped a tear from Hawking's cheek. Jane Hawking, speaking on BBC Radio 4's Woman's Hour, spoke of meeting Jones several times while Jones prepared for the role. When she saw the finished film, she was amazed to see that Jones had incorporated her mannerisms and speech patterns into her performance. By 8 October 2013, principal photography had begun, with the shooting being based in Cambridge and at other locations in the United Kingdom. Prior to the start of principal photography, Working Title had begun shooting on the lawn in front of the New Court building from 23 September 2013 to 27 September 2013; they filmed the Cambridge May Ball scene, set in 1963. On 24 September 2013, scenes were filmed at St John’s College, The Backs in Queen’s Road and Queen’s Green. The New Court lawn and Kitchen Bridge were included features in the filming location of the piece. The May Ball scene was the last of the outside shoots, with filming in a lecture theatre the following day and the remaining filming completed in the studio over the final five weeks of production. The pyrotechnic specialists Titanium Fireworks, who developed the displays for the London 2012 Olympic Games, provided three identical firework displays for the May Ball scene. Composer Jóhann Jóhannsson scored The Theory of Everything. His score in the film has been described as including "[Jóhannsson's] signature blend of acoustic instruments and electronics." Jóhannsson commented that "it always involves the layers of live recordings, whether it's orchestra or a band or solo instrument, with electronics and more 'soundscapey' elements which can come from various sources." The soundtrack was recorded at Abbey Road. During editing, filmmakers tried to remake Hawking's synthesised voice, but it did not turn out as they wanted. Hawking enjoyed the film enough that he granted them permission to use his own synthesised voice, which is heard in the final film. The film takes various dramatic liberties with the history it portrays. Writing for the film blog of UK daily newspaper The Guardian, Michelle Dean noted: "The Theory of Everything's marketing materials will tell you it is based on Jane Hawking's memoir of her marriage, a book published in the UK as Music to Move the Stars and then reissued as Travelling to Infinity. But the screenwriter's gone and rearranged the facts to suit certain dramatic conventions. And while that always happens in these based-on-a-true-story films, the scale of the departure in The Theory of Everything is unusually wide. The film becomes almost dishonest – in a way that feels unfair to both parties, and oddly, particularly Jane Hawking herself." In Slate, L.V. Anderson wrote that "the Stephen played by Eddie Redmayne is far gentler and more sensitive" than suggested in Travelling to Infinity. The Slate article further noted that the character Brian, Hawking's closest friend at Cambridge in the film, is not based on a real individual but rather a composite of several of his real-life friends. The film alters some of the details surrounding the beginning of Stephen and Jane's relationship, including how they met, as well as the fact that Jane knew about Stephen's disease before they started dating. Slate also comments that the film underplays Hawking's stubbornness and refusal to accept outside assistance for his disorder. "The movie presents the demise of their relationship as a beautiful, tear-soaked, mutually respectful conversation. Of course that didn’t actually happen either. Jane's book describes a protracted breakup that comes to a head in a screaming fight on vacation. She also described devastation when Hawking announced by letter he was leaving her for his second wife, Elaine Mason. He ended up married to Mason for 10 years before that fell apart and then he and Jane mended fences. Which, as it happens, the movie fudges too. It tries to present the rapprochement as coming when Hawking was made a Companion of Honour in 1989, but that actually happened before the couple separated." Physicist Adrian Melott, a former student of Dennis Sciama, Hawking's doctoral supervisor portrayed in the film, strongly criticised the portrayal of Sciama in the film. On 8 October 2013, Universal Pictures International had acquired the rights to distribute the film internationally. On 10 April 2014, Focus Features acquired the distribution rights to The Theory of Everything in the United States, with the plan of a 2014 limited theatrical release. Shortly after, Entertainment One Films picked up the Canadian distribution rights. The first trailer of the film was released on 7 August 2014. The Theory of Everything premiered at the Toronto International Film Festival on 7 September 2014, where it opened in the official sidebar section, Special Presentations. The film had a limited release in the United States on 7 November 2014, expanded in successive weeks to Taiwan, Austria, and Germany, ahead of a United Kingdom release on 1 January 2015, before being released throughout Europe. The Theory of Everything earned $122,873,310 worldwide, with its biggest markets coming from North America ($35.9 million), and the United Kingdom ($31.9 million). The film had a North American limited release on 7 November 2014; it was released in five theatres and earned $207,000 on its opening weekend, for an average of $41,400 per theatre. The film was then widely released on 26 November across 802 theatres, earning $5 million and debuting at No. 7 at the Box Office. During its five-day Thanksgiving week, the film earned $6.4 million. Film review aggregator Rotten Tomatoes reports that 79% of critics gave the film a positive rating, based on 227 reviews with an average score of 7.3/10. The site's consensus states: "Part biopic, part love story, The Theory of Everything rises on James Marsh's polished direction and the strength of its two leads." Metacritic, assigned the film a weighted average score of 72 (out of 100) based on 47 reviews from critics, considered to be "generally favorable". Catherine Shoard of The Guardian wrote, "Redmayne towers: this is an astonishing, genuinely visceral performance which bears comparison with Daniel Day-Lewis in My Left Foot." Lou Lumenick, in his review for The New York Post, called the film "tremendously moving and inspirational." Justin Chang of Variety noted praise, remarking, "A stirring and bittersweet love story, inflected with tasteful good humor...." He continued by praising the "superb performances" from Redmayne and Jones, as well commenting very positively about Jóhannsson's score, "whose arpeggio-like repetitions and progressions at times evoke the compositions of Philip Glass", whilst praising John Paul Kelly's production design and Steven Noble's costumes. Leslie Felperin of The Hollywood Reporter remarked, "A solid, duly moving account of their complicated relationship, spanning roughly 25 years, and made with impeccable professional polish", praising Delhomme's cinematography as having "lush, intricately lit compositions" and adding "a splendor that keeps the film consistently watchable", and Jóhannsson's score as "dainty precision with a ineffable scientific quality about it." The Daily Telegraph's Tim Robey granted the film a positive review, stating that, "In its potted appraisal of Hawking's cosmology, The Theory of Everything bends over backwards to speak to the layman, and relies on plenty of second-hand inspiration. But it borrows from the right sources, this Theory. And that's something," while praising Redmayne's performance, McCarten's script, and Delhomme's cinematography. Deadline.com's Pete Hammond marked McCarten's script and Marsh's direction for praise, and of the film's Toronto reception, wrote: To say the response here was rapturous would not be understating the enthusiasm I heard—not just from pundits but also Academy voters with whom I spoke. One told me he came in with high expectations for a quality movie and this one exceeded them." The film was not without its detractors. Some criticised Marsh's focus on Hawking's romantic life. Alonso Duralde of The Wrap stated that "Hawking's innovations and refusal to subscribe to outdated modes of thinking merely underscore the utter conventionality of his film biography." Eric Kohn of Indiewire added that "James Marsh's biopic salutes the famous physicist's commitment, but falls short of exploring his brilliant ideas." Dennis Overbye of the New York Times noted that "the movie doesn't deserve any prizes for its drive-by muddling of Dr. Hawking's scientific work, leaving viewers in the dark about exactly why he is so famous. Instead of showing how he undermined traditional notions of space and time, it panders to religious sensibilities about what his work does or does not say about the existence of God, which in fact is very little." Writing for The Guardian's film blog, Michelle Dean argues that the film does a disservice to Jane Wilde Hawking by "rearrang[ing] the facts to suit certain dramatic conventions...The Theory of Everything is hell-bent on preserving the cliche." The film's producers, writer, director Marsh, and actors Redmayne and Jones were widely favoured for award season success. The Theory of Everything received several awards and nominations following its release. At the 87th Academy Awards, it was nominated in the categories of Best Picture, Best Actor for Eddie Redmayne, Best Actress for Jones, Best Adapted Screenplay for McCarten, and Best Original Score for Jóhann Jóhannsson, with Eddie Redmayne winning the film's sole Academy Award for his performance. The film was nominated for ten British Academy Film Awards, (winning for Best Adapted Screenplay, Best British Film and Best Actor), five Critics' Choice Movie Awards, and three Screen Actors Guild Awards. At the 72nd Golden Globe Awards, Redmayne won Best Actor – Motion Picture Drama and Jóhannsson won Best Original Score. The film and Jones were also nominated. Production designer John Paul Kelly earned a nomination for Excellence in Production Design for a Period Film from the Art Directors Guild, while the producers were nominated for Best Theatrical Motion Picture by the Producers Guild of America. ↑ "THE THEORY OF EVERYTHING (12A)". British Board of Film Classification. 12 November 2014. Retrieved 12 November 2014. 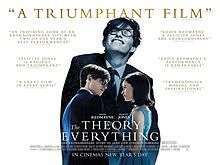 ↑ "The Theory of Everything". Toronto International Film Festival. 6 August 2014. Retrieved 6 August 2014. 1 2 3 "The Theory of Everything (2014)". Box Office Mojo. Retrieved 12 March 2016. ↑ Bullock, Dan (10 April 2014). "Stephen Hawking Biopic 'Theory of Everything' Set for Nov. 7 Launch". Variety. Retrieved 10 April 2014. ↑ "'The Theory Of Everything' Trailer Is A Heartbreaking Inspiration". Huffington Post. 6 August 2014. Retrieved 6 August 2014. 1 2 3 4 5 6 7 8 9 10 11 "The Theory of Everything begins principal photography". Working Title Films. 8 October 2013. Retrieved 8 October 2013. ↑ Anderson, L.V. (7 November 2014). "How Accurate Is The Theory of Everything?". Slate Magazine. Retrieved 3 January 2015. 1 2 "First Look At Oscar Contender 'The Theory Of Everything' — An Unexpected Love Story About Stephen Hawking". Deadline.com. 6 August 2014. Retrieved 6 August 2014. ↑ Levy, Emmanuel (5 September 2014). "Theory of Everything: Making Movie about Stephen Hawkings". Emmanuel Levy. Retrieved 16 September 2014. ↑ "Toronto: THR Honors 'Theory of Everything' Stars and Director With Breakthrough in Film Awards". Hollywood Reporter. 7 September 2014. Retrieved 7 September 2014. ↑ Child, Ben (18 April 2013). "Eddie Redmayne set to play Stephen Hawking in biopic". The Guardian. Retrieved 11 April 2014. ↑ White, James (23 June 2013). "Felicity Jones Joins Theory Of Everything". Empire Magazine. Retrieved 23 June 2013. ↑ Armitage, Hugh (24 June 2013). "Felicity Jones cast in Stephen Hawking biopic 'Theory of Everything'". Digital Spy. Retrieved 24 June 2013. ↑ Bullock, Dan (8 October 2013). "Emily Watson Joins Working Title's 'Theory of Everything'". Variety. Retrieved 8 October 2013. 1 2 Child, Ben (8 October 2013). "Eddie Redmayne, Felicity Jones Line Up For James Marsh's 'The Theory of Everything'". The Hollywood Reporter. Retrieved 8 October 2013. 1 2 "Eddie Redmayne on playing (and meeting) Stephen Hawking". Entertainment Weekly. 18 August 2014. Retrieved 18 August 2014. 1 2 "Toronto: 'The Theory of Everything' Made Stephen Hawking Cry". Variety. 7 September 2014. Retrieved 7 September 2014. ↑ Wilson-Dickson, Andrew (18 October 2015). "Julia Wilson-Dickson obituary". The Guardian. Retrieved 14 November 2015. ↑ Bullock, Dan (9 October 2013). "Hawking Biopic 'The Theory Of Everything' Starring Eddie Redmayne Begins Filming". The Hollywood News. Retrieved 9 October 2013. ↑ "Felicity about Theory of Everything – Shooting of the May Ball & Boat Club scenes". Addicted to Eddie's Blog. 26 March 2014. Retrieved 26 March 2014. ↑ Armitage, Hugh (24 September 2013). "EXCLUSIVE: First pictures of Eddie Redmayne playing Stephen Hawking on film shoot in Cambridge for The Theory of Everything". Cambridge News. Retrieved 24 September 2013. 1 2 "Cambridge Theory of Everything". Scudamores. 1 October 2013. Retrieved 1 October 2013. ↑ "TRINITY COLLEGE CAMBRIDGE MAY BALL FIREWORKS 2014". Scudamores. 20 June 2014. Retrieved 20 June 2014. ↑ "GENERAL NEWS SCORES SOUNDTRACK Jóhann Jóhannsson Provides The Beautiful Score For Focus Features' THE THEORY OF EVERYTHING". We Are Movie Geeks. 26 August 2014. Retrieved 26 August 2014. ↑ "RECORDING AT ABBEY ROAD FOR JOHANN JOHANNSSON 'THEORY OF EVERYTHING' FEATURE FILM MUSIC". Bakermoon. 21 August 2014. Retrieved 21 August 2014. ↑ Setoodeh, Ramin. "How Eddie Redmayne Became Stephen Hawking in 'The Theory of Everything'". Variety. Retrieved 24 February 2015. 1 2 3 Dean, Michelle (14 November 2014). "The Theory of Everything does Jane Hawking a disservice". theguardian.com. The Guardian. Retrieved 19 November 2016. 1 2 Anderson, L.V. (7 November 2014). "How Accurate Is The Theory of Everything?". slate.com. Slate. Retrieved 19 November 2016. ↑ Melott, Adrian L. (2015). "Views: The Theory of Everything is Missing Something: Letter from Adrian L Melott". Astronomy & Geophysics. 56 (2): 2.9. doi:10.1093/astrogeo/atv057. Retrieved 19 November 2016. ↑ Editors, TIFF (9 October 2013). "The Theory of Everything". Toronto International Film Festival. Retrieved 9 October 2013. ↑ Editors, EFilmWorld (9 October 2013). "The Theory of Everything – 2015 Film". EFilmsWorld. Retrieved 9 October 2013. ↑ Child, Ben (7 August 2014). "First trailer revealed for Stephen Hawking biopic The Theory of Everything". The Guardian. Retrieved 7 August 2014. ↑ Child, Ben (6 August 2014). "FTIFF: Eddie Redmayne is Stephen Hawking in trailer for 'The Theory of Everything'". Sound On Sight. Retrieved 6 August 2014. ↑ Editors, The Guardian (29 July 2014). "Toronto film festival 2014: full lineup". The Guardian. Retrieved 29 July 2014. 1 2 "Toronto: 'Theory of Everything' Has the Right Formula for Oscars". Variety. 7 September 2014. Retrieved 7 September 2014. ↑ Child, Ben (22 July 2014). "Toronto Film Festival Lineup Includes Denzel Washington's 'Equalizer,' Kate Winslet's 'A Little Chaos'". Variety. Retrieved 22 July 2014. ↑ McNary, Dave (10 April 2014). "Stephen Hawking Biopic 'Theory of Everything' Set for Nov. 7 Launch". variety.com. Retrieved 11 April 2014. ↑ Team, The Deadline (10 April 2014). "Focus' 'Theory Of Everything' Set For November; Relativity Dates 'November Man' For August; Disneynature's 'Monkey Kingdom' Due In 2015". Deadline. Retrieved 10 April 2014. ↑ Child, Ben (6 August 2014). "Stephen Hawking Biopic The Theory of Everything Trailer Released, Movie Stars Eddie Redmayne". E! Online. Retrieved 6 August 2014. ↑ Brian Brooks (30 November 2014). "'Theory Of Everything' Expands With Gusto Amid Huge 'Imitation Game' Opening". Deadline.com. Retrieved 1 December 2014. ↑ "The Theory of Everything (2014)". Rotten Tomatoes. Retrieved 13 February 2015. ↑ "The Theory of Everything (2014)". CinemaScore. 14 November 2014. Retrieved 29 December 2014. ↑ "The Theory of Everything (2014)". Metacritic. 14 November 2014. Retrieved 30 December 2014. ↑ "The Theory of Everything review: Hawking's story packs powerful punch". The Guardian. 7 September 2014. Retrieved 7 September 2014. ↑ "This Stephen Hawking biopic is a good bet for Oscar nods". The New York Post. 8 September 2014. Retrieved 8 September 2014. ↑ "Toronto Film Review: 'The Theory of Everything'". Variety. 7 September 2014. Retrieved 7 September 2014. ↑ "'The Theory of Everything': Toronto Review". The Hollywood Reporter. 7 September 2014. Retrieved 7 September 2014. ↑ "The Theory of Everything, review: 'tasteful and affecting': Toronto Review". The Daily Telegraph. 8 September 2014. Retrieved 8 September 2014. 1 2 "Toronto: 'Theory Of Everything' Sends Oscar Race Into Early Overdrive As TIFF World Premieres Keep On Coming". Deadline.com. 8 September 2014. Retrieved 8 September 2014. ↑ Duralde, Alonso (8 September 2014). "'The Theory of Everything' Review: Eddie Redmayne Gives Body and Soul to a By-the-Numbers Biopic". TheWrap. Retrieved 11 November 2014. ↑ Kohn, Eric (8 September 2014). "Toronto Review: Eddie Redmayne and Felicity Jones Salvage Stephen Hawking Biopic 'The Theory of Everything'". Indiewire. Retrieved 11 November 2014. ↑ Overbye, Dennis (27 October 2014). "The Leaky Science of Hollywood – Stephen Hawking's Movie Life Story Is Not Very Scientific". New York Times. Retrieved 28 October 2014. ↑ Dean, Michelle. "The Theory of Everything does Jane Hawking a disservice". The Guardian Film Blog. The Guardian. Retrieved 11 November 2014. ↑ "TIFF: Stephen Hawking story 'The Theory of Everything' spurs Oscar talk". Entertainment Weekly. 7 September 2014. Retrieved 7 September 2014. ↑ "Toronto: Eddie Redmayne Leaps to Head of Oscar Pack for 'Theory of Everything'". The Hollywood Reporter. 7 September 2014. Retrieved 7 September 2014. ↑ "BAFTA Nominations: 'Grand Budapest Hotel' Leads With 11 – Full List". Deadline.com. 8 January 2015. Retrieved 9 January 2015. ↑ Gray, Tim (15 December 2014). "'Birdman,' 'Grand Budapest' Top Critics Choice Awards Nominations". Variety. Retrieved 15 December 2014. ↑ "Nominees Announced for the 21st Annual Screen Actors Guild Awards". SAG-AFTRA. 10 December 2014. Retrieved 10 December 2014. ↑ "'Birdman', 'Foxcatcher' Among Art Directors Guild Nominees". Deadline.com. 5 January 2015. Retrieved 5 January 2015. ↑ "'American Sniper,' 'Birdman' & 'Boyhood' Among PGA Awards Nominees". Deadline.com. 5 January 2015. Retrieved 5 January 2015.